Toulouse, France: European planemaker Airbus sought to quash speculation of further delays to its A380 superjumbo on Monday, 15 October, as it handed over the first giant plane to Singapore Airlines after two years of setbacks. "There are no delays; that is a misunderstanding," Airbus sales chief John Leahy told reporters at a ceremony to mark the long-awaited first delivery of the world’s largest airliner. Asked if Airbus was reaffirming its 2008 delivery target of 13 aircraft, Leahy said, "That is our plan and we are on target. We have said it is a challenge, of course, but we are on track." A foul-up over the installation of the 500 km of wiring on the double-decker A380 planes toppled Airbus management, pushed the planemaker into loss and put back Europe’s biggest industrial project by two years, leading to 10,000 job cuts. 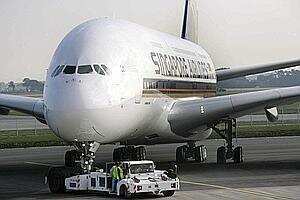 The A380 is not a luxury, it is a necessity. That’s why increasing A380 production to meet demand remains our biggest challenge for the next two years," Airbus Chief executive Tom Enders told Airbus staff, suppliers, journalists, and other guests. "Everything we have accomplished so far gives us the confidence, the courage and the means to face the big ramp-up in 2008 and 2009," he said. The first aircraft was delivered to Singapore Airlines 18 months later than planned at a ceremony at Airbus’s headquarters in Toulouse, France, which featured pounding music and a high-tech light show against a curtain which was drawn back to allow gathered guests to see the massive plane nosing into a parking stand.